Well, your comments on this post inspired me to continue engaging Gabriel in the kitchen. I like the idea of one of these, but the price tag seriously curbs my enthusiasm. While standing on a chair poses some dangers, I feel fairly confident as long as I’m standing right there with him . . .
. . . with my leg on the chair to keep him from scooting it away from the counter — somewhat limits my productivity, but better than him fussing on the floor. Unfortunately, he REALLY latched on to the “chair in the kitchen” idea, to the point that he would [attempt to] drag a chair into the kitchen EVERY time I set foot in the room, even if I was just going in for a minute to refill my water or quickly check on something in the oven. It was cute for the first three times or so, but it got old really fast, especially when he greeted each and every announcement that “it wasn’t time to have the chair in the kitchen” with serious screamage. Sigh. In addition to the basic annoyance of his compulsion to be right there ALL the time, there was the additional safety concern that he would climb up onto the chair and access the counter top at a time that I hadn’t cleared it of dangers, like sharp knives, cheese graters, and/or breakables. Enter a benefit of a galley kitchen. 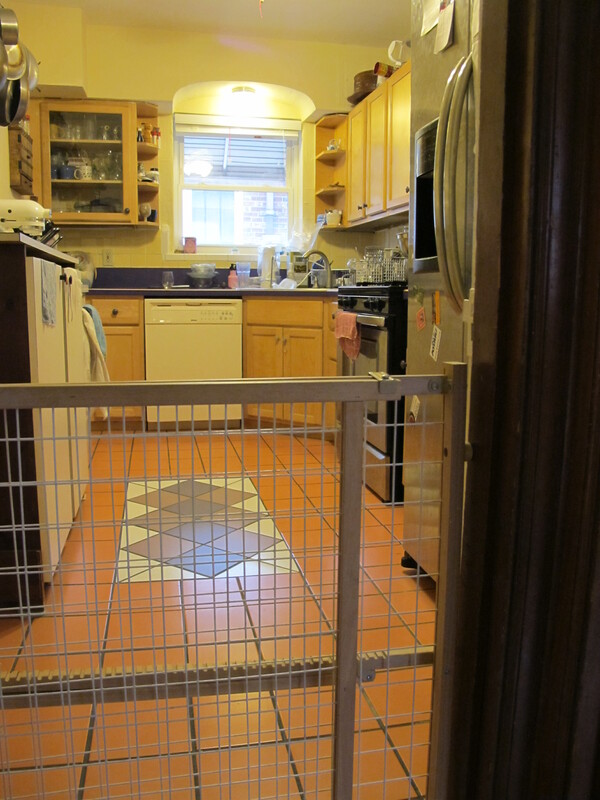 While I love the idea of an open floor plan, with [a big, fancy] kitchen open to the dining room, living room, and/or great room, I’m currently enjoying the fact that our cozy kitchen is a completely separate room with a doorway — perfect for a basic wooden baby gate. I’m also thankful that my long legs allow me to easily step over the gate so I can enter and exit the kitchen freely (though stepping over it while carrying plates of hot food and breakable dishes IS a bit of a gamble). While Sir is not thrilled about the development, he has more or less accepted it. I’m a bit bummed to be actively excluding him from something that I want him to (eventually) be part of, but it’s an acceptable solution for now, for this stage. This entry was posted in Food, My Life and tagged cooking, toddlers. Bookmark the permalink. Consider replacing the chair with a lower step stool… 8 or 9 inches. It’s what Benjamin uses, and allows him to participate, but not tall enough that he can climb onto the counter or reach things on the rear of the counter. Additionally, the feet have “grippies” to prevent sliding around. We’ll probably give that a try — been meaning to get him a step stool for washing hands in the bathroom anyway. I think it’s a wonderful solution. Many are the times I’ve thought about crafting some sort of a door for my kitchen to keep the Fe-lions out when I’m cooking. One in particular just HAS to be right there with me 24/7, and while it is sweet, it’s also dangerous. I live in fear that she’s gonna get one of us killed one of these days. Yeah, it’s interesting, the kitchen in our apartment actually used to have a door, as evidenced by the frame and still present hinges. I thought it would be odd to have a door to close off such a small space, but it could be useful for keeping the rest of the house cooler by keeping the heat contained to the kitchen (where it could be removed with the exhaust fan and/or a fan in the window) in the summer. Hmm, maybe we should keep our eyes open for an extra door . . .
By the way, Ben also drags the step stool around to any room where he wants to reach things that I have purposely put up high, but at least the dragging sound will alert you. We also keep certain things in lower cabinets that he is totally allowed access to since they are safe, such as his own plates and cups so he can help get dinner ready. He also knows that butter knifes are okay but sharp knives are not. We are having a similar conversation right now though because Ben figured out how to open the fridge and yesterday it became the place to put every letter from his alphabet one by one. So limit setting is an ongoing process, keep smiling!